One concept that comes up in evaluations and therapies is being able to determine what things go together (like hammer and nail, bowl and spoon, etc.). This usually involves the child looking at a picture of something and having to choose from another set of pictures what goes with it. 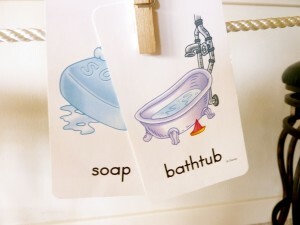 Being able to match things up like this requires the child to access prior knowledge and if there is no past personal experience than use reasoning skills and logic to determine what makes the most sense. 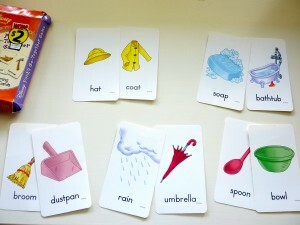 The concept of matching objects with their functions or knowing what objects go together is part of a child’s cognitive development. This was a concept I wasn’t sure if Andrew was grasping when we first began doing My Obstacle Courses with him. I knew this would fit in perfectly as a station activity and had lots of ideas for how to do so. While I try to use real objects when I can to help reinforce and build concepts and skills with Andrew, there are some times when it’s not practical or possible and when that happens I love using things that are easy to set up and are also fun and kid-friendly. 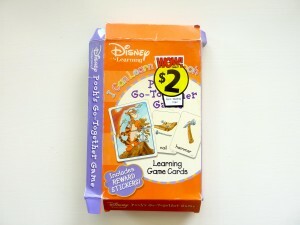 I found some Winnie the Pooh Go Together cards at Walgreens (this was years ago and I’m not sure if they still sell them at Walgreens so I’ve attached an Amazon link: for Pooh’s Go Together Game click here ). Some of the cards that "go together." Matching pair flipped over to make picture. 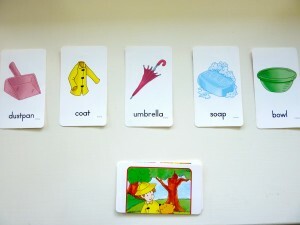 If the picture doesn't work the cards are not a match. 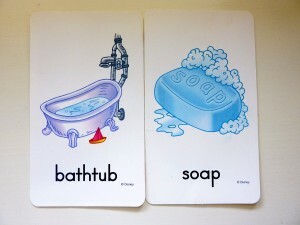 When a game or activity is self-checking, it usually means that when the cards or cutouts are flipped over, they will either make a picture or give some indication through symbols (letters, numbers, shapes, or colors) that the choice was correct or incorrect. Self-checking pictures made when things that "go together" are matched up. I like this because it takes the parent aspect out of the picture a bit – it’s not me determining that it’s right or wrong. If the picture doesn’t match, it is not the correct choice. 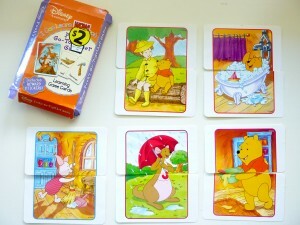 With this particular game, when the correct match is made and the cards flipped over, they make a picture of Winnie the Pooh characters in a scene using the objects that “go together.” This is great because we can find the objects in the picture and talk about how they are being used together to help out the characters. 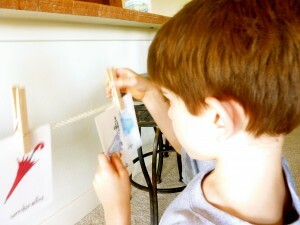 My Obstacle Course station activity: Match up the pictures that go together. Flip the top card in the pile. It is a hat. Which of those pictures above goes with a hat? A hat and a coat go together. Flip them over to see if it's correct! It's a match! 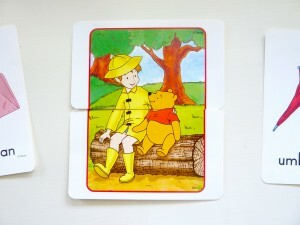 Christopher Robin is wearing a hat and a coat. I think it must be about to rain because he also has rain boots on! 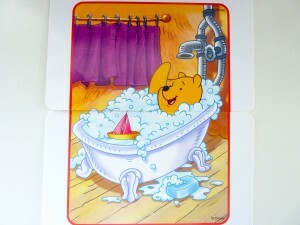 Andrew matching up a bar of soap with a bathtub. Things that go together matched and clipped onto the clothesline. 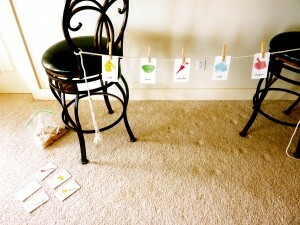 This is such an easy station activity to set up and can give a lot of information about a child’s ability to determine which objects go together. 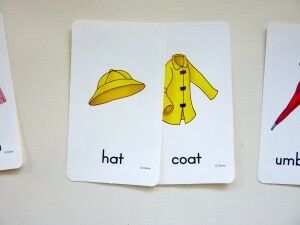 These cards allowed me to learn about Andrew’s knowledge of things and what experiences we needed to introduce him to. 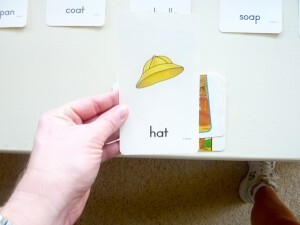 We could talk about how the things were being used with some favorite characters and most importantly, we were having fun together as we flipped the cards over to make pictures. I have to say my $2.00 Walgreens purchase proved to be a wonderful investment!